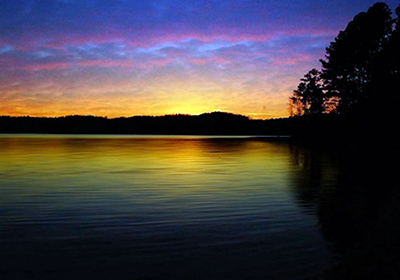 Jordan Lake State Recreation Area was established in 1981, the result of a partnership between the federal government and the state of North Carolina. It created a multi-use destination from the lake area created by the B. Everett Jordan dam project. The dam project that created Jordan Lake accomplished several purposes for the rapidly developing Research Triangle area of the state -- flood control, water supply and water quality protection, fish and wildlife conservation, and recreation. 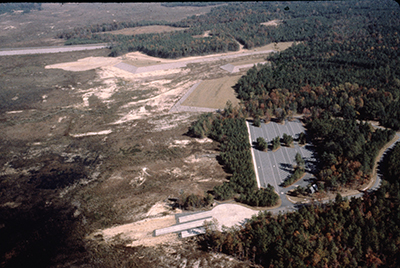 The site itself, encompassing more than 46,000 acres, sits in the New Hope River Valley with the lake and surrounding rivers part of the Cape Fear River basin drainage area. Today, the state managed recreation areas occupy more than 4,500 acres around the 200 mile perimater of the 13,900 acre lake. Nine recreation sites managed by the state include access to hiking trails, campsites, and water activities: Crosswinds Campground, Ebenezer Church, New Hope Overlook, Parker's Creek, Seaforth, Vista Point, Robeson Creek, Poplar Point, and White Oak. The New Hope River Valley has been the site of a broad range of cultures for more than 10,000 years. Archaeologists have explored the remains of 450 prehistoric and historic sites in the area and have uncovered many Native American artifacts. The land was later settled by Scottish Highlanders in the 1740s, and it saw action in both the Revolutionary and Civil wars. Several sites, including a 19th century farm and rural community are now on the National Register of Historic Places. Farming provided the livelihood of residents before and after the Civil War, and cotton and tobacco were farmed along with food staples, and by the early decades of the 20th century significant portions of the area had been stripped of forest by the timber industry. Following a hurricane and flood disaster that struck the Cape Fear River Basin in 1945, Congress directed the U.S. Army Corps of Engineers to undertake a comprehensive study of flood issues and water resource needs in the area. The project, then known as New Hope Lake, was authorized in 1963 and construction began in 1967. With intervening legal and construction issues, it would take 14 years until the lake was first filled in 1981. In 1973, the name of the project was changed to B. Everett Jordan Dam and Lake in honor of the former senator from North Carolina. The area encompassing the lake and surrounding park lands, more than 46,000 acres, is owned largely by the federal government and was aquired from homeowners and small rural farms. In 1981, the state of North Carolina took on a 50-year lease for management of the developed recreational facilities, and the lake was impounded the same year. Jordan Lake sits in the western edge of the Durham Triassic Basin, as part of a fault that runs north to south. More faults and joints sit beneath the lake within the stone conglomerates and sandstone. A few areas of the lake sit over older igneous rock from the Carolina Belt Series from the pre-Cambrian or Lower Paleozoic era. The natural communities of the area consist of Piedmont forest and wetland habitats. Although there are several rare plant and animal species in Chatham County that exist around the lake area, only one -- the Bald Eagle -- is found on land managed by the Division of Parks and Recreation. Habitat around the lake is home to many other familiar animals including including other birds of prey such as osprey and hawks, heron, deer, songbirds, flying squirrels, and beavers. North Carolina Division of Parks and Recreation. Jordan Lake State Recreation Area. http://www.ncparks.gov/jordan-lake-state-recreation-area (accessed December 1, 2015). Images of Jordan Lake State Recreation Area, State Parks Collection, NC Digital Collections. Items about Jordan Lake State Recreation Area, NC Digital Collections. http://digital.ncdcr.gov/cdm/search/searchterm/Jordan%20Lake/field/subje...? (accessed December 1, 2015). "Arial view of White Oak area and marina before impoundment of the lake." Photograph. North Carolina Division of Parks and Recreation. Theil, Melissa. "Scenic Sunset, Jordan Lake State Recreation Area." Photograph. March 8, 2015. State Parks Collection, NC Digital Collections. http://digital.ncdcr.gov/cdm/ref/collection/p16062coll27/id/229 (accessed December 1, 2015). McMurray, Steve. 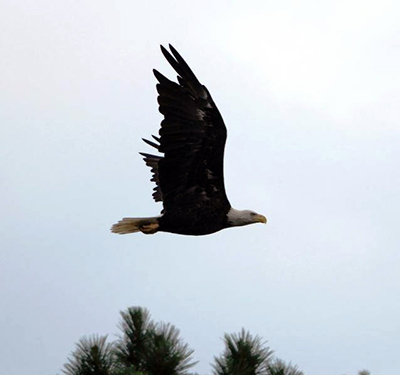 "Bald Eagle in Flight." July 12, 2010. State Parks Collection, North Carolina Digital Collections. http://digital.ncdcr.gov/cdm/ref/collection/p16062coll27/id/66 (accessed December 1, 2015).